Earlier this month, Angela Beeching hosted a Creative Productivity Challenge. I was unable to join the live sessions, so I decided to do them out of time this week to boost me into a productive winter break. If you don't know Beeching's work, her wonderful book Beyond Talent is my go to resource for everything from concert planning, to teaching resumes, to tax deductions. As she says, "The time to do your best creative work is now." So, let's jump right in! The first day focused on five creative habits for getting work done, or as I like to think of it, dissertation-flashback. Listening to her talk about creative habits prompted me to find this little piece of paper, which I have saved even though it has long outlived its purpose. It reminds me of many late afternoons sitting out on the fire escape reading chapters out-loud and making corrections in blue pen. While I had to adjust slightly, I successfully turned in the full draft to my advisor by the end of the year so I'd have time to do revisions. As clear from the above photo, several of the habits Beeching mentioned—time blocking, dividing & conquering, and backwards planning—were essential to getting all of it done on time. My main reset for 2018? Working distraction free! As a commitment to this—and at Beeching's suggestion—I just bought an alarm clock that is not my phone! I recently moved and am finally starting to find a routine in my new home, and I'd for love that routine to be one that helps me move forward with my longterm projects. For more ideas on creative habits to get work done, listen to the entire Day 1 session here.
. . . I argued that you don't know if your actions are futile; that you don't have the memory of the future; that the future is indeed dark, which is the best thing it could be; and that, in the end, we always act in the dark. The effects of your actions may unfold in ways you cannot force or even imagine. They may unfold long after your death. That is when the words of so many writers often resonate most. I love that Beeching talks so much about curiosity and experimentation as the midpoint to get back to being in a place of creative flow. In fact, I watched this session twice to hear it more clearly and challenge myself to answer the questions she asks. She mentions briefly that walking helps her, which I have also found essential. Moving through physical space helps me to move forward in mental space. And honestly, walking is the only thing that consistently works to get me to reset if I'm feeling truly stuck. (In fact, half of the works on my album Wanderweg use field recordings from these walks.) The final exercise Beeching details, "grateful flow," you should experience for yourself as a part of the Day 2 session here. In this session, Beeching tries to help people focus on defining the core of their work, and the impact they want to make with their music. Beeching often helps clients to find this for specific projects, but she adds, "Whether you write it in your promotional materials or just know it for yourself, it matters." She talks about the immediate goal of a project versus the larger impact or change we want to make. Beeching calls this, "Know your WHY." The rigor that Beeching speaks about rings true in every session: that committing to doing consistent work, and having habits/rituals to get you into that work can help to boost motivation, creativity, and access to what many artists refer to as "flow." The way that she uses the Hero's Journey to help someone figure out where they are in their process is wonderful. Listen to the entire Day 3 session here. How do we allow for the playful, exploratory, and experimental part of the process as well as for the critical, and analytical part? About two years ago, I started to incorporate improvisation into my practice, recording it so that I could use that material to compose. It was a way for me to spend more hours in the sound world of playful experimentation. What’s your process like and how do expectations factor in? I have a system for practicing the viola now that works for me that has to do with timed focused sessions and timed restful breaks. Focused practice is meditative for me, and I think improvising and composing opened up my practice in a new way to helping me approach the instrument with a relaxed, connected technique. I realized listening to Beeching talk about expectations that I have the unhealthy expectation that I should be able to practice without breaks, that I should be able to work harder always. So for me, using the timer for daily practice in combination with really big longterm projects gives me motivation to put in the time and the wisdom to take time for slow, practice really listening to sound. What tools or approaches help you to “ship” the work—to complete your work and get it out in the world? Deadlines, pure and simple. I've gotten better at knowing how long I need and then planning ahead. That way, I am giving myself the time to work at my pace and turn out good work. Beeching emphasizes in this session to keep doing creative work, and that the process of exploration and discovery will help the individual be able to "offer that generously to the world." Listen to the whole session on creative process here. The last day of the Creative Productivity Challenge is about confidence. Beeching says, "Confidence doesn't come before you do something ambitious, it's the result of having done the ambitious thing." She talks about how confidence is not a static state, but rather part of a process within the flow of commitment, courage, capability, and confidence. I'm working on a commission right now that I had a strong concept for immediately. I was hesitating to execute the concept because I wasn't sure if I would be able to record the sound I wanted, and if I botched it then I worried it would make the whole concept seem ridiculous. So, I decided to go full in: I made a deadline by asking the amazing recording engineer at my University to reserve hours to record, and told him exactly what we would be doing: recording the sound of paper sculptures. Having the appointment and having an expert who showed me respect and took me seriously allowed me to focus completely and really experiment and play with the sounds I wanted in the studio. So I would add to this last session, confidence is not only about process for me, but about working with others who also show that commitment, courage, and capability so that there is playful and inquisitive confidence, not posturing. Surrounding yourself with people who enrich your process is so essential, and allows for you to be creative and not let anything get in your way. Listen to the other tips for increasing creative confidence in the whole session here. It was great being able to work through these sessions, and to use this post as an accountability tool for myself. If you're reading this, I encourage you to do the Creative Productivity Challenge yourself. It's never too late to start! Tuesday will be our last class and final concert for the Contemporary Music Ensemble at University of Northern Colorado! Earlier this semester, the group performed works by Jürg Frey and Pauline Oliveros as a part of the School of Music's Day of Music for which students organize concerts in the community (pictured above). As the semester comes to a close, I'd like to offer this second playlist as a way to encourage continued listening beyond the classroom. As I mentioned in the original post, these are some living composers/sound artists that students should know if they're studying with me. And as with the previous list, these are people whose music I admire and listen to. Flanigan builds sound sculptures—sometimes modified found speakers, sometimes handmade amplification objects—and often uses the feedback in conjunction with her own voice to create multi-layered sonic landscapes. In her own words, these works embrace "both the transparency and residue of process." Flanigan is brilliant and her music is gorgeous and now I'm gushing just listen. Sound artist and abstract turntablist Maria Chavez’s wonderful book Of Technique: Chance Procedures on Turntable explains different techniques that Chavez has developed through her career as a performer. What I love about Chavez’s music is that she takes found objects from the environment and finds their beauty through focused listening and attention in her sets. The records Chavez uses are mostly found damaged and would otherwise have been discarded. Taking these objects and turning them into a vital part of avant-garde DJing is what makes Chavez’s music so unique. Giving the objects a new voice points to the idea that forgotten or discarded peoples can be empowered to have a voice through advocacy. Saariaho's wonderful NPR interview when L'Amour de Loin was staged by the MET Opera last season: https://www.npr.org/sections/deceptivecadence/2016/12/03/503986298/half-of-humanity-has-something-to-say-composer-kaija-saariaho-on-her-met-debut. The excerpt below is Tamara Mumford as the Pilgrim singing to the Countess. Mumford's incredibly moving and intelligent interpretation of this important character in the opera stole the show. This is an album I come back to—the transition into the last track, “Jar” puts me back into a specific emotion I felt hearing Melissa Hughes perform it live. Cooper’s music explores sound worlds that could only be heard through electronic manipulation, and explores how this similarly affects our perception and feeling about people who in our modern world are always filtered through some kind of electronic medium (whether social media or text threads). In an interview Cooper said, "The beautiful thing about working with electronic music is that new technology constantly allows us to develop and focus on new sounds." Young visited the Contemporary Music Ensemble to present her music and improvise with us earlier this month while she was here at University of Northern Colorado to produce my recording of her piece Sun Propeller. Young's music is expansive and lyrical, and her expertise in computer programming allows for this expressiveness to be transferred into the electronics she creates naturally, keeping her voice and vision. I strive toward a polyphony of oppositional voices and perspectives in my music, and to bring the chaotic forces of life into the work itself. It was this impulse, and the unabashedly political tone of Osman's poetry, that made me want to set some part of Corporate Relations to music. DiCastri is a professor at Columbia University, and has a wonderful sense of textures and drama. Her work for the group Yarn/Wire last year was incredible and I hope there will be a production of it again soon! Part of her compositional process involves working directly with sound, either improvising with her voice or by manipulating recordings of effects that she wants to use in her music. This genesis from the sound itself makes these modern techniques and timbres visceral and dramatic. This is a more in-depth video showing the production of Cerrone's opera Invisible Cities that was staged in the Los Angeles train station. Cerrone is inspired by texts and is an avid reader of poetry and literature. This work is based on the Italo Calvino book of the same name. As with the Saariaho opera, it asks, what are we describing when we describe the other? Are we describing ourselves or are we truly observing? How do we go outside ourselves to explore new places and people, or do we experience them more truly when we allow ourselves to be tangled up with them? 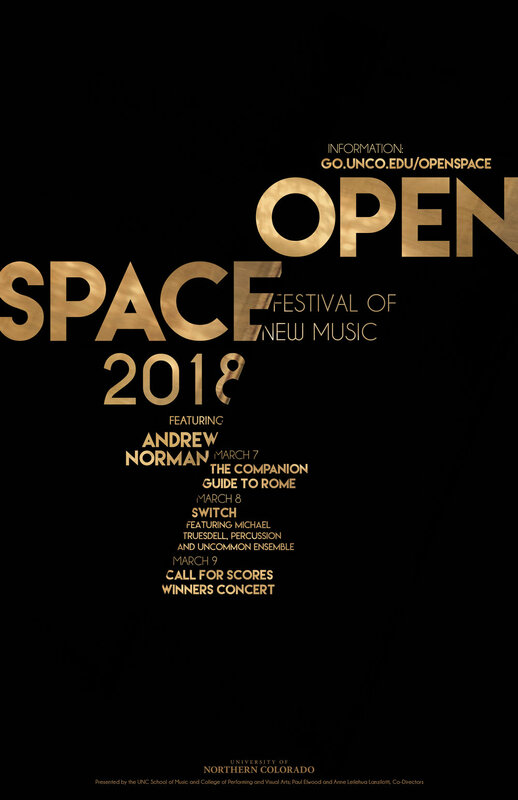 A note about Cerrone, Cooper, and Hearne: they are part of a composer collective called Sleeping Giant including Andrew Norman (in the previous list). I included these composers because they are people I know from graduate school and work with professionally to this day. Another person in graduate school with all of us who "wasn't a composer" at the time? Caroline Shaw. I point this out to remind anyone reading this that 1) no list is totally objective—these are people I find interesting, not a definitive list, and 2) play your peers' music! We are making a point in this final concert to play both the music of established composers, and music by members of the Contemporary Ensemble themselves. Play your peers' music. End of detour. I met Ueno in 2010 when we were both living in Berlin. He was generous with inviting fellow expats over to the American Academy, and was wonderful to talk to about sound and his philosophy of music making. Ueno writes music for other performers on traditional instruments, as well as performing himself, often using his voice to create incredible timbral sonic drones. This is is a video I shared earlier in the semester, but I'd like to end with it because it inspires me to think about making sound, and what our role is as contemporary musicians. Read the previous post in this series, "A Contemporary Music Ensemble Playlist." 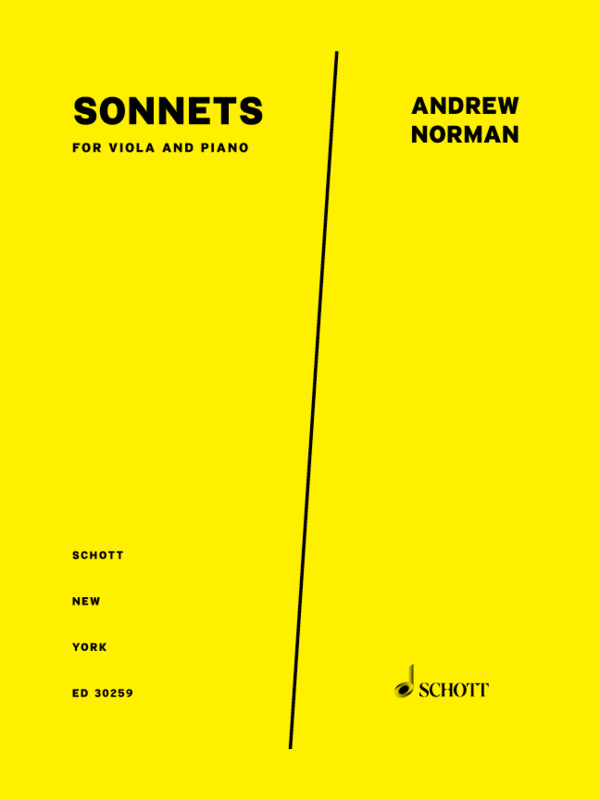 A new edition of Andrew Norman’s “Sonnets” for viola & piano that I edited is now available on PSNY — Project Schott New York as a digital download or physical score, and for European orders of physical copies on Schott Music. Soft Aberration is now out on New Focus Recordings! Alex Ross included the album in a playlist of new and recent recordings of interest earlier this fall. I'm so proud of Scott's wonderful work, and hope you will enjoy listening as well! Update: read Alex Ross's wonderful description of Scott's music in The New Yorker, “. . . somewhere in the borderland between Minimalia and Feldmanistan.” Also, Soft Aberration has been included in The New Yorker's Top Ten Recordings of 2017, Best of Bandcamp Contemporary Classical November 2017, and Spotify's Top Classical of 2017. Now available on Bandcamp, iTunes, and Amazon! I happened to see Glenn Ligon’s Double America 2 (2014) at The Broad in Los Angeles when I was working on this piece. I remember waiting while a group of college students took selfies in front of it so that I could take a video with my phone to send to Scott. Ligon’s work, for neon and paint, is the word AMERICA in large capital letters inverted under itself. The lower AMERICA in the sculpture flickers slightly, unstable—a phenomenon that we are so used to it seems unintentional. And yet, is this Double America a reflection of itself? Ligon’s work is informed by his experience as an African American in the United States—his piece seeks to expose the idea of multiplicity in America, and in the self. While these two works are seemingly unrelated, the idea of trying to essentialize experience made me view my interpretation of Wollschleger’s America differently. Is America a set of clear identities struggling against each other? Is America a complex texture that exposes multiplicity? Is America endless lines of strip malls that blur into a texture of gray in a car trip across the country? A series of flickering gas station signs? Is America an unraveling hopefulness that is only revealed for a moment? Perhaps once we identify something we oversimplify it. Wollschleger’s America resists as it rotates through glitchy, fragile material. Read the previous post in this series on "Bring Something Incomprehensible into This World." Read the next post in this series on "White Wall." In anticipation of the release of Scott Wollschleger's debut album, Soft Aberration, I will be sharing my program notes for each of the works. This week's notes are on Bring Something Incomprehensible Into This World for trumpet and soprano. I think there’s a semiology of duet—how do you treat two people or two things that are going to have a discursive interaction? The text, [originally: “Bring something incomprehensible into the world!”] is from the philosopher Gilles Deleuze in reference to Heinrich Von Kleist. I think of the title as a very affirmative statement of what I personally think the goal of art should be: rendering something into existence that is inconceivable before it happens. That to me is the most powerful thing I can imagine doing with my energy. The trumpet and voice are in a playful dialogue. The text is presented in fragments. The fragments are made of single words or just syllabic sounds. I found breaking the text up into smaller sounding parts allowed me greater flexibility when writing the piece and ultimately allowed for a more free-spirited approach. The arrangement of the vocal sounds sometimes imply new words and phrases. 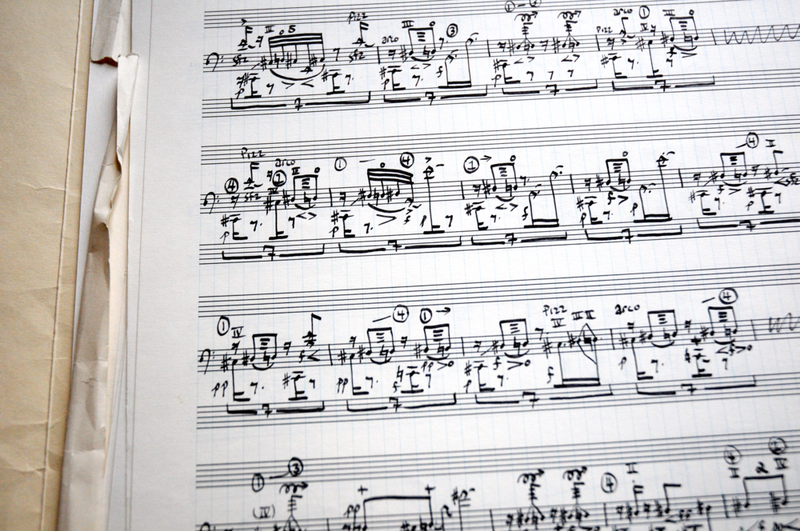 Now framing different works on the album, each section of the piece takes on a different exploration of sound. We start hearing how little melodic fragments of this piece are hiding in other works. Often the trumpet and the voice blend together to create what I call a “dirty unison.” I imagined the sounds of the words themselves being “smeared” by the trumpet’s sounds. I think the interaction between the voice and the trumpet implies a kind a hybrid instrument or a mutant offspring that is the combination of the trumpet and the human voice. Rather than pulling the words apart more, this version in three parts becomes the mantra or philosophical goal of the album: Bring Something Incomprehensible Into This World. There are not going to be concrete solutions anytime soon but there are going to be concrete experiments that are pushing to articulate a new version of the real. You’re doing this in all its unclear and painful glory. . . . Just remember you’re not crazy. You’re actually creating a new way of thinking. Read the previous post in this series on "Soft Aberration." Read the next post in this series on "America."